BMW of Monterey Grand Reopening Celebration! Name: BMW of Monterey Grand Reopening Celebration! You're invited! 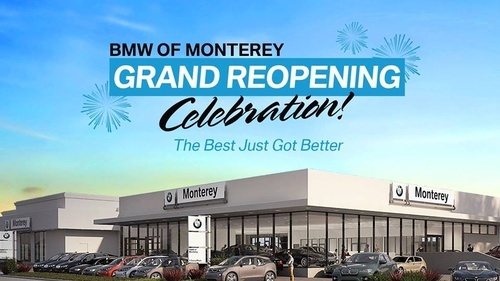 Save the date for BMW of Monterey's Grand Reopening Celebration! Our new, state-of-the-art showroom is now open and we want you to celebrate with us on Saturday, March 23rd, from 6pm to 8pm. We'll have specialisty BMW vehicles on site including an X7, an 850 Coupe, a 3 Series and a M3 CS! We also are giving away an exclusive BMW Thermal Driving Experience, including airfare and hotel so stop by and enter to win! You will enjoy food and drinks from local vendors like Hahn Family Winery while you take in everything our new and advanced dealership has to offer. Join us on March 23rd and see for yourself how the Best Just Got Better! Grand Re-Opening Giveaway Disclaimer: No purchase necessary. Valued at $1,847.06. A purchase does not increase chances of winning. See Official Rules below.Must submit entry form at BMW of Monterey (1 Geary Plaza, Seaside, CA, 93955) to enter. Entries accepted during Grand Re-Opening Celebration on 3/23/19, from 6 p.m. to 7 p.m. Odds of winning depend on the number of entries received. PRIZE: Trip to BMW Thermal Driving Experience (Includes the BMW Thermal Driving Experience, Airfare, and hotel for one). Estimated Retail Value $1,847.06 ($849 for Thermal Driving Experience, $538.06 ARV for Airfare from Monterey, CA, to Palm Springs, CA, and $460 ARV for 2 nights of Hotel stay at the Embassy Suites La Quinta Hotel & Spa). BMW of Monterey will pay all applicable state and federal taxes. Drawing will occur at 7:30 p.m. on 03/23/19. Must be years of age 18 or older with valid US Driver’s License to enter. Only one entry per person. Employees of Lithia Motors and their families are ineligible for entry. Winner not required to be present at drawing. If winner cannot be reached within 30 days of the drawing, a new winning name will be drawn. No duplicate prizes. Winners must agree to allow Lithia Motors to use their name and photo likeness in future marketing. List of winners/proof of prize value may be obtained by mailing request to 1 Geary Plaza, Seaside, CA, 93955.